Since I missed Tuesday’s run, I made sure to get out on Wednesday. The plan was to run Wednesday and then again on Thursday. Unfortunately, that didn’t happen. But, the Wednesday run did happen. Since I had such a slow Disneyland 10K, I had hoped to bounce back this week. On Wednesday, I did! 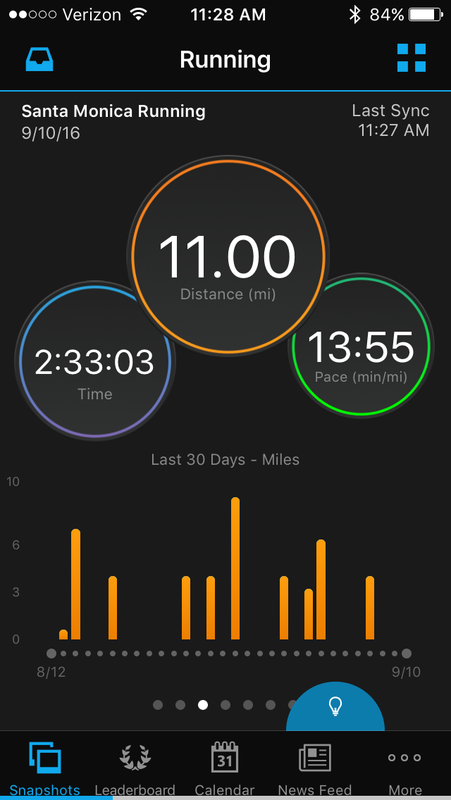 The plan was to run 30 seconds, walk 90 seconds for the first mile and decide what to do next based on my time. Well, mile 1 was a pretty good one! It wasn’t my best first mile over this route. However, it was still pretty good. Even though I was a little tired heading into the run, My time was looking decent the entire way. I finished in 12:10. So, I decided to switch to the 60 second walk breaks for mile 2. Well, mile 2 went pretty well. I even felt pretty good while running in mile 2! Each quarter-mile, I could see evidence that I’d finish the mile in less than 12 minutes. Once I got past the first half of mile 2, the question I began to wonder is how fast the mile would be. The answer? 11:35! I was at 23:46 by the end of mile 2. So, there was no time to rest on how well that mile went. If I wanted to have a good finish time, I needed to keep moving forward. 60 second walk breaks for mile 3 and maybe 4. I was pretty surprised how well I felt running in mile 3. It felt amazing to be pushing myself again! Also, it was so freeing to not have to worry about runners 5 across the road to block me. I was running my pace and no excuses! Each quarter-mile was telling me that I’d finish this mile well. I kept seeing a good number! By the end of the mile, it was confirmed. I finished mile 3 in 11:34! It was the fastest mile yet! At 35:19, it was time to push for a sub 48 minute, 4 mile run! I measure these runs a quarter-mile at a time. I do so because a 12 minute per mile pace is 3 minutes each quarter-mile. It’s easy math. Just like the previous two miles, these quarter-mile check ins were looking good. I was loosing time in this mile, like always. But, I wasn’t loosing time that bad. If I could just keep these intervals going, I would like what I saw….and I did! Mile 4 took 12:13! It was typical for mile 4 to be the slowest. However, it was only 3 seconds slower! I’ll take it. Overall, it was one of my best 4 mile runs in this training cycle! I missed my Thursday run. So, Saturday was the next run. 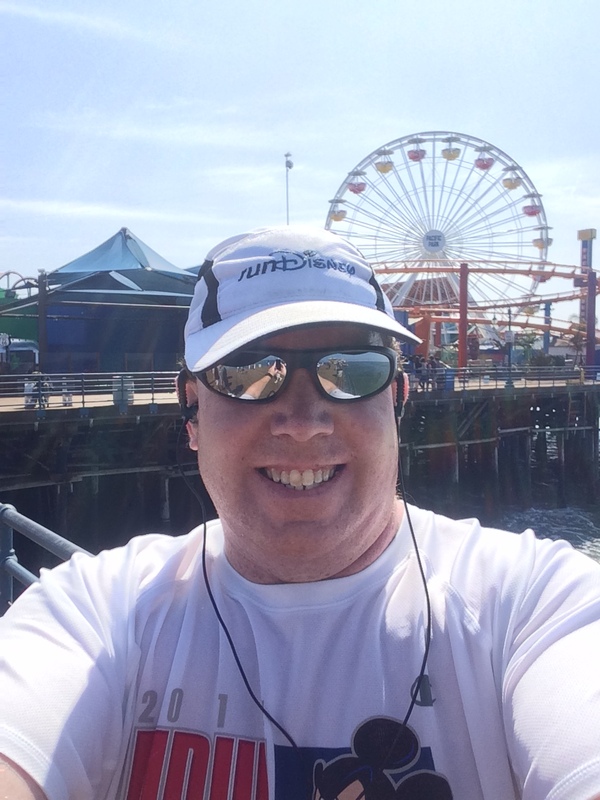 Since there was 11 miles on the calendar, I decided to head back to Santa Monica. 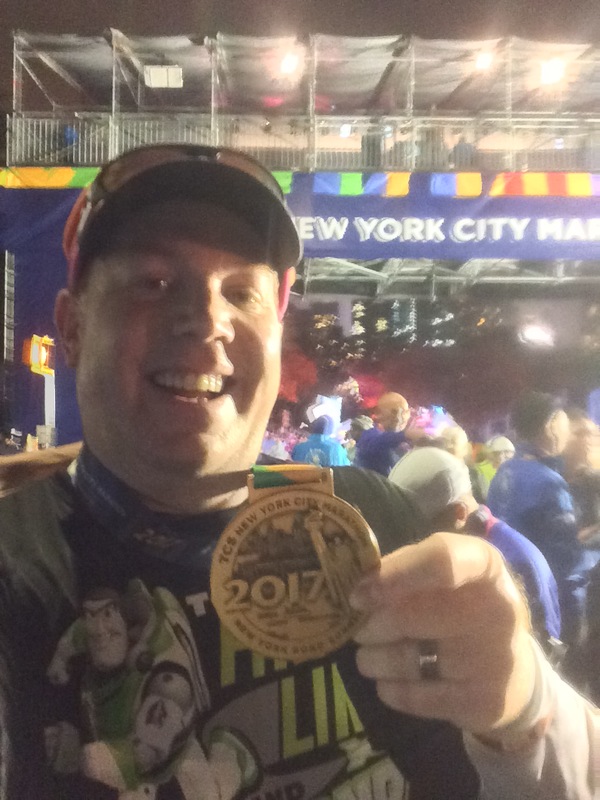 If you recall, my last run before beginning the Avengers Super Heroes Half Marathon training was an 11 mile run at the same place. I thought it would make for a good comparison. I decided to run 30 seconds and walk 90 seconds the entire way. I debated over this the entire way to Santa Monica. By the time I arrived, I decided to just get the 11 miles in and let the results be whatever they would be. It’s pretty interesting to look at. I had a better first mile and finished better. However, overall, this was a better run. 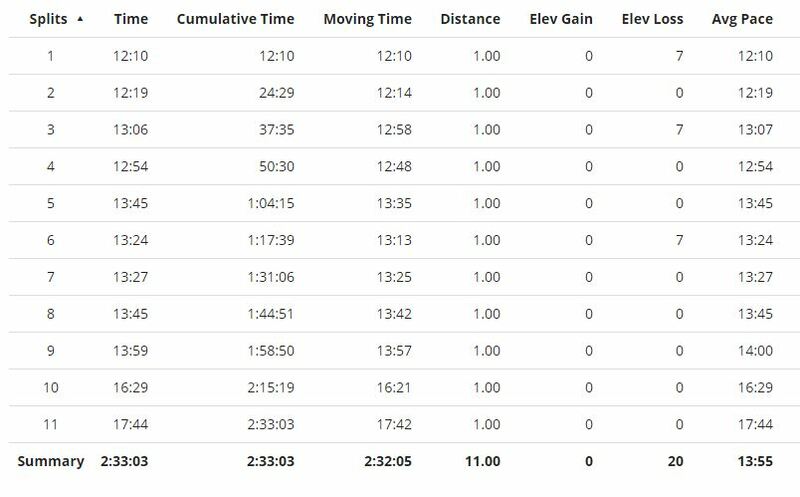 You’ll notice in my splits from this time around, miles 10 and 11 were the slowest of the bunch by quite a lot. The reason? By the start of mile 10, I was starting to crack. By 9.50 miles, I got that twinge in my lower left leg again and couldn’t shake it. So, I decided to walk out the last mile and a half. Still, by the time I got to the first turnaround at around 4.6 miles, I was feeling pretty good! I was ahead of my previous long run at that point! As I turned to go back, I was feeling alright. 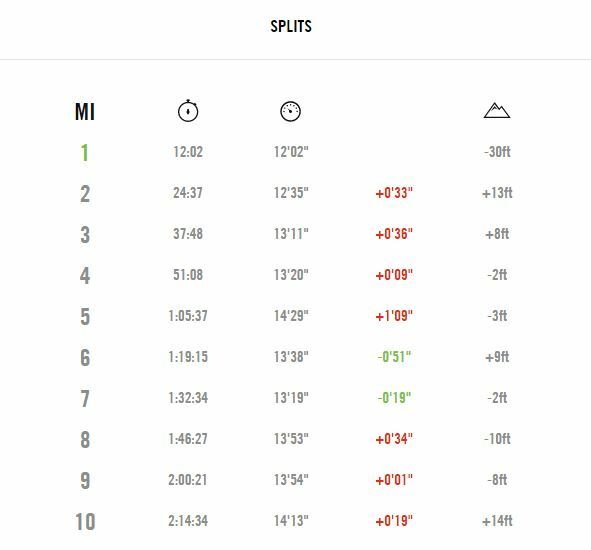 I was actually very surprised by how long it took me to finish mile 5…13:45. Really? If you check the splits, miles 6 and 7, I battled back. However, in mile 8 I started feeling the struggle. By the end of mile 9 the wheels were coming off this run really quickly. I stopped briefly to take on a Cliff Blok just after my run interval that brought me into mile 10. I tried to get myself mentally back in this run. However, the run intervals that followed fell short of 30 seconds and I was just ready to be finished. Then, the leg started having problems. By 9.50 miles, I was down to a walk. Even with the walk, I finished! As I started having to walk because of the cramp, I felt defeated. As I continued to walk along, I reminded myself that it was really important to just finish and to do so in a manner that allowed me to fight again. The finish was far from spectacular. However, as I looked back on my previous run, I’ll take it. I mean, I was a little more than 3 minutes slower than that run while walking the last mile and a half. When I looked at the splits, I wondered how different this run would have been if I knew them before running this time. Oh well. At least I finished. By the way, nothing helps you get over a bad run like an awesome little guy like I have at home. It made me feel pretty cool to see Colton enjoying MY Tigger. It was a Circle of Life kind of moment to watch my Tigger become Colton’s. His enjoyment made it totally worth it! I was going to try to make up my missed run on Sunday. 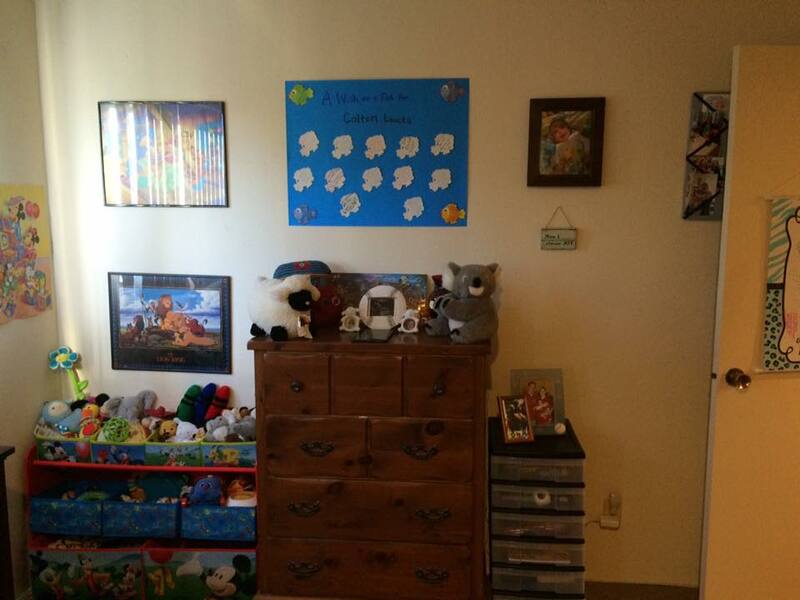 However, this weekend, the mission was to get Colton’s nursery finished. Y’all, this bookshelf was a beast to complete. However, it looks amazing! Don’t you think? Colton already has enjoyed being read to in this rocking chair! Here’s the final pic to share. You’d never know that this room was once a sports office for Brooke and I. 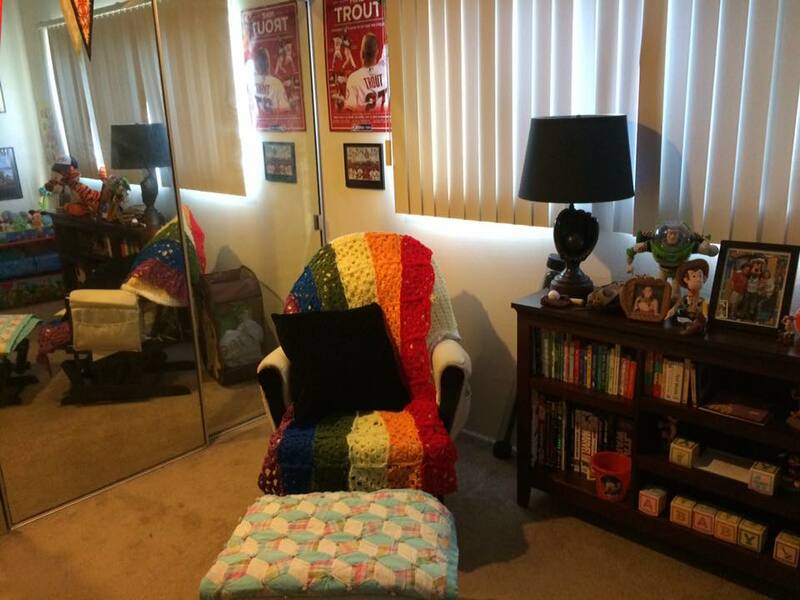 This room is totally Colton’s now! It’s pretty amazing to think that our two bedroom apartment has both bedrooms being used as bedrooms. I still remember when I finished putting together Colton’s crib…before we even knew we’d have a little one to put in it. I remember praying to God…please give us someone to put in this crib. That was back in February. It was the first real step in putting a nursery together. Now, the nursery is pretty much finished and we have this amazing little boy who gets to enjoy it! God is so good! He doesn’t always give us what we ask for in the moments when wen want it. But, when he does…it’s more amazing than you ever thought it could be. In about a week and a half (September 22nd), we can file the paperwork to finalize the adoption of Colton. Then, we’ll be in God’s hands again as to when it will happen. In our hearts, Colton is our boy. I can’t wait until he will be seen as our boy in the eyes of the State of California! Missing a run happens. I’m bummed that I’ve done so. But, it’s on to week 10 and another chance to hit my goal of 3 training runs in the week. So, bring it Week 10! 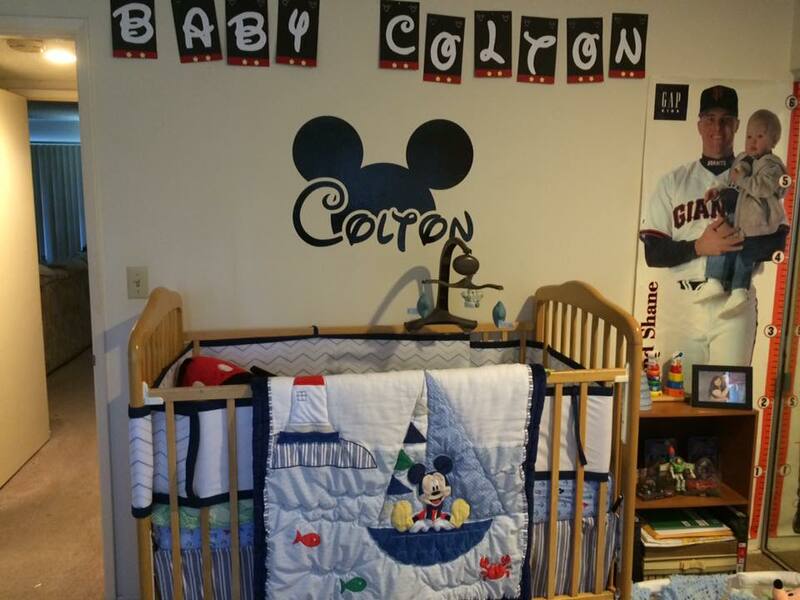 and colton’s nursery is THE CUTEST! love love love!! Oh no! Hope you feel better soon. The Disneyland Paris Half Marathon Weekend will be here before you know it! 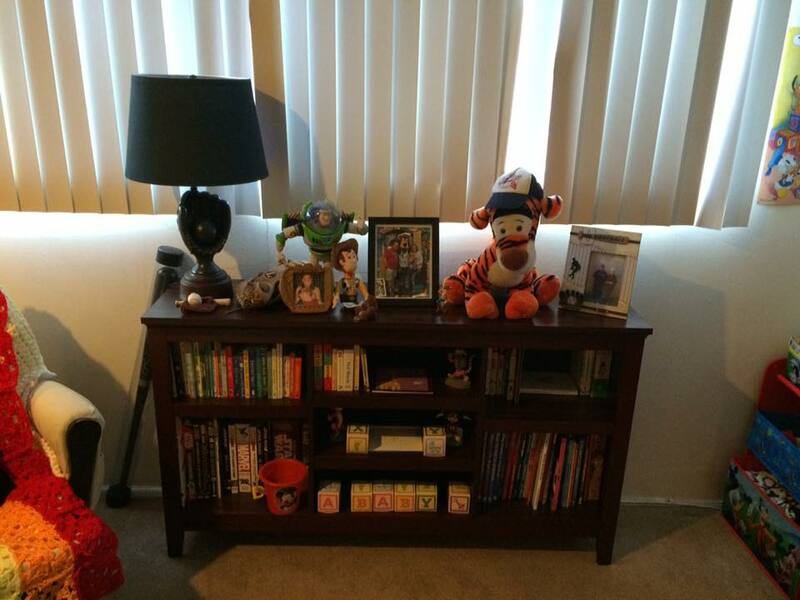 Thanks for the compliments on Colton’s nursery. The wife and I worked hard on it and love the way it all turned out as well!